“Phew, I’ve not gained anything!”: Aren’t you relieved when your bathroom scales show that? Probably – but actually your bathroom scales don’t measure your weight directly. Instead, the load cell built into it converts the weight force into a path. In many industrial applications, bending beams and shear beams are often used for such measurements. Background: How is weight measured? Whether your bathroom scales, a finely calibrated laboratory balance or the gravimetric level monitor of a silo: In all cases, these are measuring instruments that determine a mass. As a rule, they measure the weight force occurring. But unlike, for example, a beam balance or a spring balance, the load cells used for this determine the weight force indirectly. For this purpose, these force transducers convert the weight force into a path. The principle: In the load cell, the weight force deforms a built-in spring or a bending beam. The intensity of this deformation then gives information about your weight, for example (more precisely about your weight force). And with that, it also answers the question of whether you can still order a dessert or just start thinking about a diet. The different design stages of force transducers in weighing technology: shear beam, bending beam, single-point and S force transducer. How can you determine how far the measuring bodies of a bending beam or shear beam load cell deform? At this point special strain gauges or thin-film sensors come into play. These are attached to or mounted in the measuring bodies. In the measurement process, they act as a mechanical intermediate stage. Example of strain gauges: These are glued to the measuring body. If the measuring body deforms, this is transferred to the strain gauges. These convert the elastic deformations proportionally into electrical signals. Such changes in resistance can be easily and very accurately measured: with a measurement accuracy of between 0.01 % and 0.05 % Fnom. The calibration is made in grams, kilograms or tons. 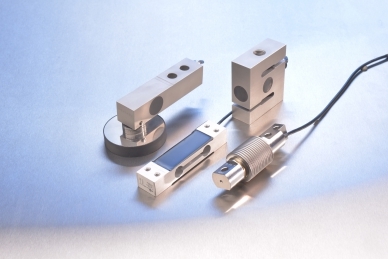 As an alternative to these glued foil strain gauges, there are force transducers with welded-in thin-film sensors: a technology that the WIKA Group excels in and with which, in the field of force measurement, it is the only supplier on the market. The thin-film technology offers a consistently high quality, an exact measurement directly in the force flow, very good temperature characteristics and a high long-term stability. With bending beams and shear beams, the standardised sensor is welded into the measuring element using a laser, which enables automated series production. Bending beams and shear beams are used in weighing technology to determine the weight of small and medium-sized vessels and are also frequently used in force measurement. In agricultural engineering, for example, such load cells are frequently encountered: for example, when weighing livestock, dosing animal feedstuff, in gravimetric level monitoring of vessels and silos or for weighing straw or hay bales directly in the baling press. But also beyond these fields of application, bending beams and shear beams can be used in a wide variety of other ways: for example, in traditional weighing machine construction, platform weighing (platform scales), weighing in process and dosing systems, vessel scales, crane scales and truck scales. In particular, in applications in the building materials industry, the chemical industry, the food industry and medical technology, bending beams and shear beams are often installed. Level and the exact mass can be measured at the same time. Access to the tank or vessel is not required (this eliminates contact with the medium). The measurement is independent of the material, its properties and the geometry of the container. The bending beam or shear beam can be easily replaced if necessary. In level measurement, the load cells must function regardless of the nature and condition of the media. Liquid or solid, aggressive, conductive or non-conductive, forming foam or dust, steaming, hot or cold, with small or large grain size, regardless of the geometry of the vessel and whether the medium in the vessel is evenly or unevenly distributed: Such factors must not affect the measuring result and the permanent function. This also applies in temperature-critical applications and where robustness and high durability are required – for example in the steel industry. In another practical example, stainless steel sparkles too: In the agricultural industry bending beams for weighing are very much in demand. When sowing or fertilising, for example, a lot of money can be saved through the exact distribution of the goods. The basis for this, as is always the case with automation, are exact measured values, which is why high-precision shear beams (which are also insensitive to side loads) are perfectly suited. Bending and shear beams are among the most commonly used load cells. 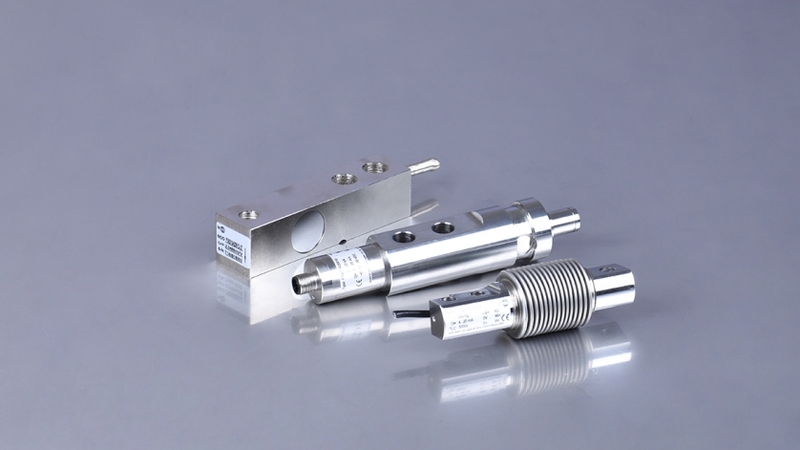 Depending on the field of application, there are other force transducers that can be used. Our program includes load cells designed for ranges between 0.3 kg and 300 t.
Single point load cells. These are used in weighing technology for platform scales with smaller and medium sizes. They are also referred to as “single points” and are also suitable for eccentric load introductions. Compression force load cells. Just like heavy-duty load cells, they are tailored to the weighing of medium and large vessels and silos. The force introduction is just as easy as the installation; furthermore, the design is robust. Tension/compression force load cells. These are mainly used for weighing suspended loads. Measurement is made directly in the force path; in addition, the installation is uncomplicated. Further information on the product range for force measurement, e.g. the model F3833 bending beam and the model F3831 shear beam, can be found on the WIKA website.